U.S. stocks followed world markets lower Monday as investors worried about increased tensions between Russia and Ukraine. 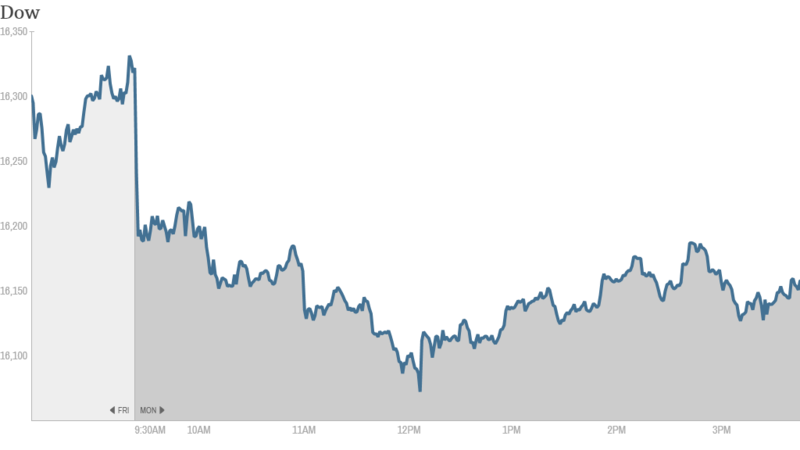 But the market recovered from the worst of the sell-off as the day wore on. The Dow ended down 154 points, or nearly 1%. Earlier, the blue chip index had lost as many as 250 points. The S&P 500 and Nasdaq fell about 0.7%. Investors were cautious following news that Russia has moved forward with military intervention in Ukraine. Ukraine's new leaders have accused Russia of declaring war. All the major European stock markets closed sharply lower, with Germany's Dax dropping more than 3%. France's CAC 40 fell more than 2% and London's FTSE 100 declined about 1.5%. The Ukraine fears hit most Asian stock markets as well. Hong Kong's Hang Seng index closed 1.5% lower and Tokyo's Nikkei dropped 1.3%. Stocks in Shanghai and Shenzhen bucked the trend and moved higher. Stocks in Russia fell the most. The Micex index tanked almost 11%, while the Market Vectors Russia ETF (RSX) was down 6%. Shares of energy giant Gazpro (GZPFY) dropped more than 10%, and Russian search engine Yandex (YNDX) was down about 14%. But some traders on StockTwits thought Yandex, often called the "Google of Russia," may be oversold. "$YNDX today movement is purely speculative," said pmatrasc. "People shorting on a "random" Russian stock - without looking at fundamentals or whatever." Trader danielmardorf said he'd consider buying Yandex because of today's slide: "$YNDX Great long term buy here." But WORLDCRIMELEAGUE said that he will wait for the conflict to stabilize, and the stock to experience more weakness before buying in. "$RSX wayyy too early to buy Russian stocks, maybe in 2 weeks, as long as things simmer down, wait till $YNDX get into the 20's," he said. Shares were at about $32 in midday trading. Investors seemed to be very concerned by threats of serious sanctions against Russia from the United States and Europe. Russia's central bank reacted by hiking interest rates, saying it wanted to maintain financial stability and inflation levels as market volatility increases. Though global markets were getting knocked down, Nigel Green, founder and CEO of deVere Group, said he doesn't expect the sell-off to last long. "There has been some volatility in the capital markets as a result of the political and military uncertainty in Ukraine, which have naturally exacerbated concerns about the country's fundamental economic weaknesses," he said. "However, I fully expect this to be a short-term phenomenon. " Green said that while Ukraine's problems may raise more concerns about emerging markets, he doesn't expect the crisis will trigger another global recession. Rather, Green said the situation will be limited to Russia and Ukraine. Joe Tatusko, chief investment officer at Westport Resources, said he thinks the market weakness "almost definitely presents a tremendous buying opportunity." 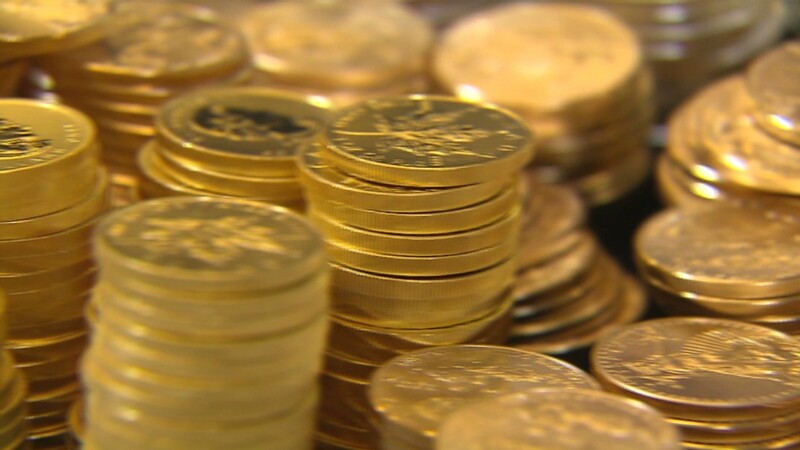 Meanwhile, as investors seek safe-haven assets, gold prices rose more than 2% to $1,351 per ounce. Investors were buying U.S. Treasuries too, pushing the 10-year yield down below 2.6% from 2.65% late Friday. Bond prices and yields move in opposite directions. The price of oil is also up, with crude prices rising by almost 2% to more than $104 per barrel. "Russia's involvement clearly magnifies the scope for contagion and increases the possibility that global energy prices will be affected both directly and indirectly," wrote Stephanie Flanders, chief European market strategist for JPMorgan asset management in London. The tension also triggered a spike in wheat and corn prices, as Ukraine is a leading exporter of both grains. The Teucrium Wheat (WEAT) and Teucrium Corn (CORN) ETFs both rose, and investors expected more gains in the coming days. "If Russian stand off continues $WEAT may be a continued play," said StockTwits trader TrendHunter. "$CORN Historically March is the best month for Corn," said tyla858. Add this Russia/Ukraine debacle to the mix...Bullish." In company news, Men's Wearhouse (MW) said Monday that it has entered into merger talks with its rival retailer Jos. A. Bank (JOSB). Shares of Lorillard (LO) surged following a Financial Times report that said Reynolds American (RAI) is possibly making a bid to buy its cigarette and tobacco rival. Reynolds shares also rose on the speculation. It and Lorillard were the two biggest gainers in the S&P 500 Monday.